These funfetti cake mix cookies are super soft and moist, just like your favorite vanilla birthday cake! Next time you are craving cake, try these! Birthday cake in a cookie! Well, not quite. Of course there is no actual birthday cake inside of these cookies that would be crazy. Crazy fun actually… hmmm… lightbulb. Ok that is an idea for another time. Funfetti cake mix cookies are a simple way to get that flavor of vanilla cake with a little color and creativity too! 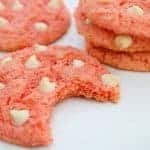 Serve these cookies as is or frost with a simple sugar cookie icing. 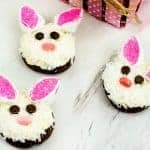 Either way they are delicious and will be a hit with friends & family of all ages. 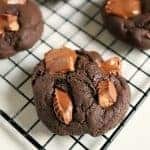 The process of making these cookies is simple. A few adjustments to a boxed cake mix and done. Basically any cake mix can be made into a cookie. I typically use half the amount of egg, oil and then add baking powder or baking soda according to what texture of cookie I want. For these cookies we wanted a nice thick soft cookie, so additional baking powder was needed. 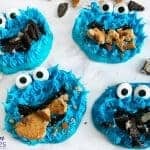 Easy Cookie Monster Cookies Featuring Funfetti!